I John Davis hereby verify that your employee Mr. Mark has been a tenant of my property located in Bay Area [House-No/Lane-No]. I also like to add that he rented this property 3 years ago on March 2nd, 2015. Initially, the agreement settled between us both confirms the rent to be $700/- per month excluding the utility bills. However, I have increased the rent in past year to $900/-. 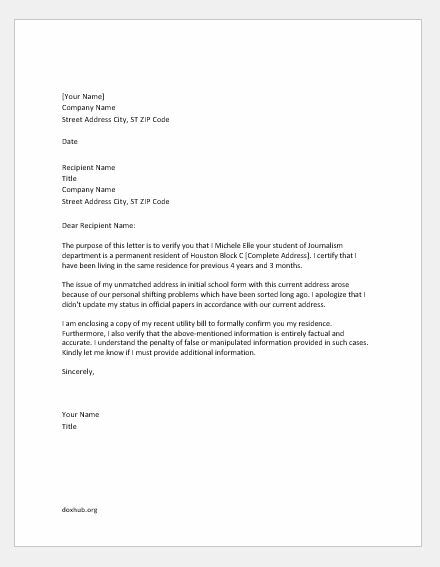 The purpose of this letter is to verify you that I Michele Elle your student of Journalism department is a permanent resident of Houston Block C [Complete Address]. I certify that I have been living in the same residence for previous 4 years and 3 months. 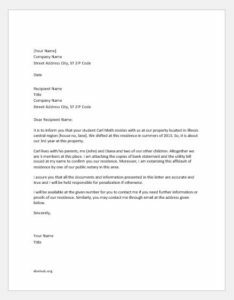 The issue of my unmatched address in initial school form with this current address arose because of our personal shifting problems which have been sorted long ago. I apologize that I didn’t update my status in official papers in accordance with our current address. It is to inform you that your student Carl Meth resides with us at our property located in Illinois central region [house no, lane]. We shifted at this residence in summers of 2015. So, it is about our 3rd year at this property. Carl lives with his parents, me (John) and Diana and two of our other children. Altogether we are 5 members at this place. 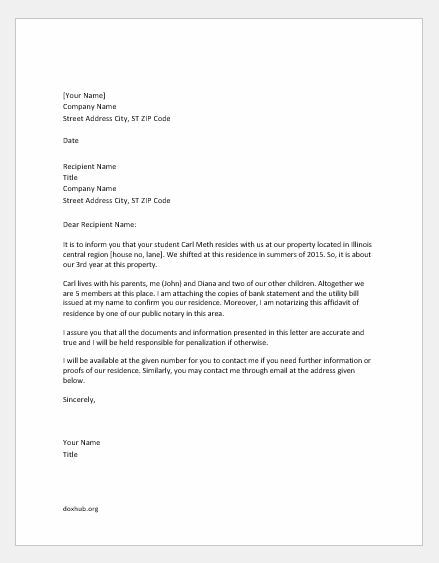 I am attaching the copies of bank statement and the utility bill issued at my name to confirm you our residence. Moreover, I am notarizing this affidavit of residence by one of our public notary in this area. 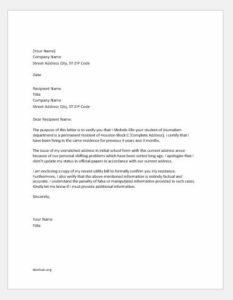 I assure you that all the documents and information presented in this letter are accurate and true and I will be held responsible for penalization if otherwise.